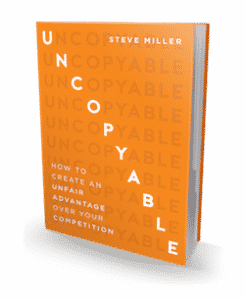 Meetings & Conventions Magazine calls Steve Miller the Idea Man for his non-traditional approach to marketing and branding. Steve calls himself Kelly’s Dad. That’s who he is. His business title is Marketing Gunslinger. In the increasingly competitive business world today, he teaches organizations how to separate themselves from the crowd. 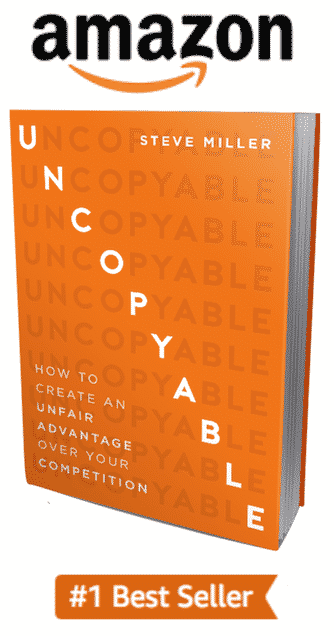 His latest book, UNCOPYABLE: How to Create An Unfair Advantage Over Your Competition, reached #1 Best seller in FOUR different marketing categories and has 58 perfect 5.0 star reviews on Amazon.com! Steve is an author, a professional speaker, and business advisor, known for his edgy, no-spin-zone style. He’s the son of the co-inventor of the 8-track, played on the PGA Tour, worked in the copper mines of Arizona, and even worked in Hollywood (all of which means he’s basically unemployable). Since founding The Adventure LLC in 1984, Steve’s consulting clients have ranged from solo entrepreneurs to Fortune 100 mega-corporations, including Proctor & Gamble (advising on the Swiffer WetJet product launch), Boeing Commercial Airplane (the 777 launch), Nordstrom, Starbucks, Caterpillar, Philips Electronics, Coca-Cola, and Halliburton, to name a few. If you’re looking for a speaker who delivers immediately implementable content in a rapid fire, engaging, and humorous style, please contact Steve!